Once a ring has been worn for many years often repairing it costs more than remaking it and the result is still a flawed ring. In the case of this heirloom ring we restored it so that it could passed on to this generation and the next. The ring for restoration is pictured below. The main issues are wear on the setting and also the band mainly caused by a ring being worn next to it. It was decided to not only restore the band but increase the width and thickness slightly more than the original. This would mean that the rings next life would be even longer. In the next photo you can see that to unset the ring I split the setting on both sides and also the band. This was done in order to eliminate any risk of damage to the diamond during unsetting. In the photos above you can see how the ring being worn next to another ring had worn the band down to a very fine width. As I mentioned in my recent article diamonds are always removed and inspected whilst the customer is present. We discovered once unset that the diamond we thought was round was closer to a cushion cut than a round. We also discovered the following issues with the diamond. A culet facet is created when the point of the bottom of a diamond is cut flat. If you have another look at the photo above you will see this clearly. Look for it also from the front in the finished photos. The next task was to digitally show the restored ring with the proposed slight changes to the band and setting dimensions for the customer to approve. With the design approved a draft was created in Sterling Silver to confirm the design. We also modified that draft to the exact finger size. Both the design and finger size were now confirmed so I could make the ring. 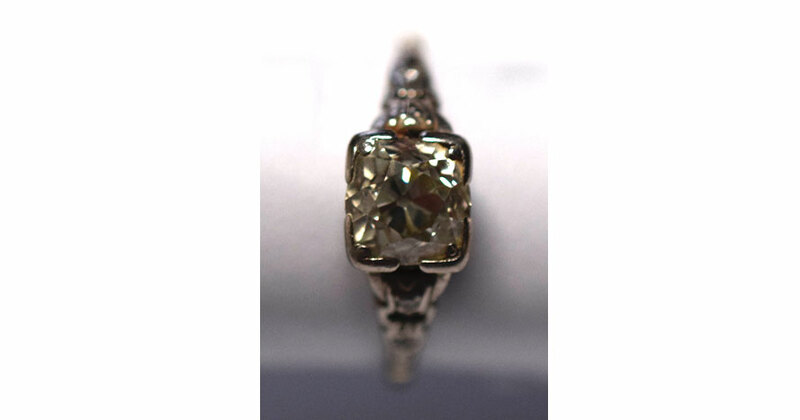 The ring was made in 18ct Palladium white gold using the customers existing diamonds. She loves the ring as does her daughter who was involved in some of the decisions of the remodelling process and is waiting inline to receive the heirloom next.